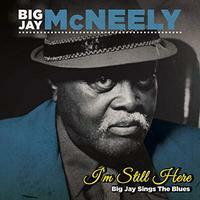 As you can probably tell from the title, Big Jay McNeely's new set turns the attention to the blues. This is quite an effective disc with several standout tunes. While the blues is often a limiting genre, McNeely and company do a great job of keeping it interesting from start to finish. This is quite enjoyable and very authentic. The bass glides in as this starts, bringing the cool groove with it. This is an old school traditional blues jam with some killer guitar fills. It's all class and style. Of course, when it's McNeely, you know you are going to get some saxophone, and this does not disappoint with a cool little solo later in the track. The cut turns almost toward a soulful psychedelia for a little while around that. Then it gets into more of a pure blues sound, but a more modern one. I've always been a big fan of this song. This version is a smoking hot one. I love the old school guitar sounds on it. The whole cut grooves so well. The slide guitar on this number brings it more into the vein of things like Robert Johnson. I dig the saxophone on the piece quite a bit. Energetic, rocking blues, this thing is fun. Again the sax lends a lot of cool to it, but the whole musical texture works so well. A slower, dramatic blues grind, I really love this tune. Everything about it is just about perfect from the slide guitar to the saxophone fills. Overall, though, it's the general tone that really pushes this over the top into the realm of the sublime. Another slow blues, this is another of the highlights of the set. I particularly love the guitar on this thing, but there is nothing here that doesn't work like magic. This is right up there with the classics of the field. There is are some intriguing hints of dissonance on this piece. It's a more up-tempo cut that is almost a Rock in Opposition exploration of pure blues. This is more of a mainstream blues tune. It's a good song, but not as strong as some of the others here. It comes across sort of as an "also ran." I dig the energy and vibe of this tune a lot. The guitar soloing is so classy, too. A slow blues with some great slide guitar, this is another solid tune. This electric blues jam makes me think of Muddy Waters in a lot of ways. It's another smoking hot tune. Another killer blues, the disc is truly ended by one of its standouts. The whole thing grooves so well, and the sax really brings a lot of the magic.